A mixed bag week started 7 days ago (as weeks are wont to do), when the closure of Mary's Peak summit road changed a spur-of-the-moment .7 mile walk up into a fullish-day's hike on a lower ridge trail. Having lazily foregone a water bottle and Sensible Footwear, I bitched my way up the first several hundred feet of elevation until the tranquilizer of natural beauty shut up my monkey mind. Late-bloomer trilliums, pink and white, scattered themselves prettily amongst the yellow clusters of Oregon grape and wood violets. 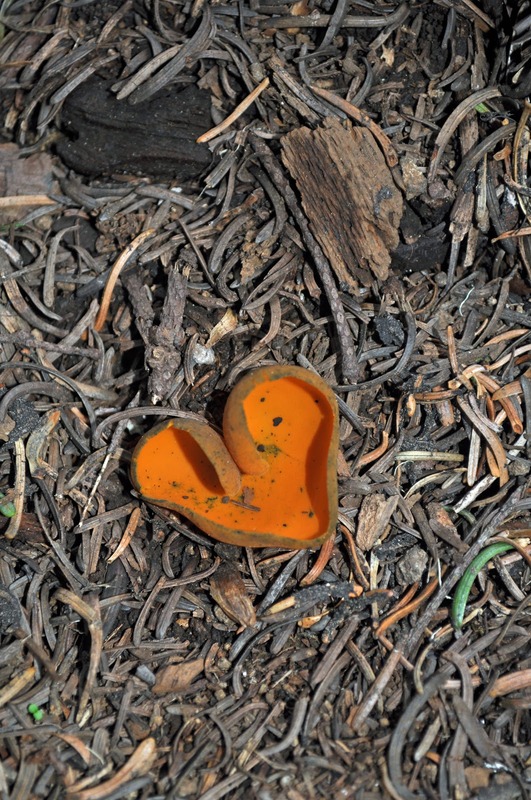 A few dozen orange peel fungi, including this one shaped like a heart, marked the left hand side of the trail for a half-mile. 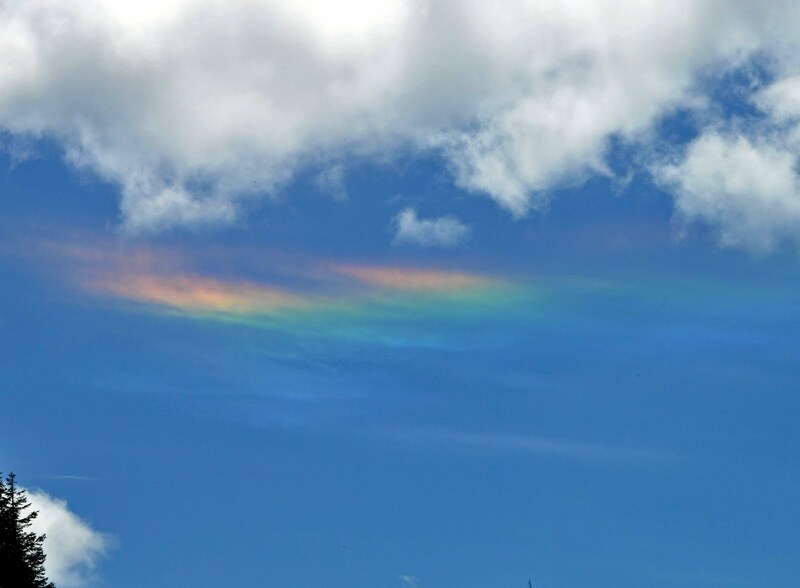 When we finally arrived at the parking lot, a view of every major peak in the Cascades, from Diamond to Hood, greeted us -- as well as this amazing iridescent cloud! I pointed it out to a young couple, deep in romantic talk and looking the other way, and had them peer through my polarized sunglass lenses for a better view. My companions and I went back to our picnic, and they to their swooning. As we packed our repast the man came up and said, "I'm getting ready to propose to her. Would you take a picture?" He left his camera, went back and knelt, withdrew a tiny sheet of paper and brought her (and at least half of the onlooking audience) to tears. It was a beautiful day. 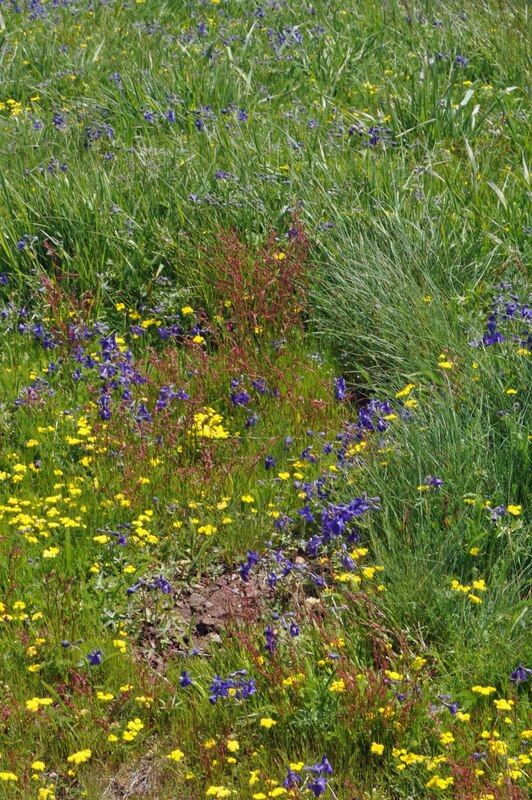 At the top of the peak, a meadow of glacier lily and other wildflowers colored the fields. A small patch of snow provided a manic treat for the three displaced Minnesotan dogs to cool off. 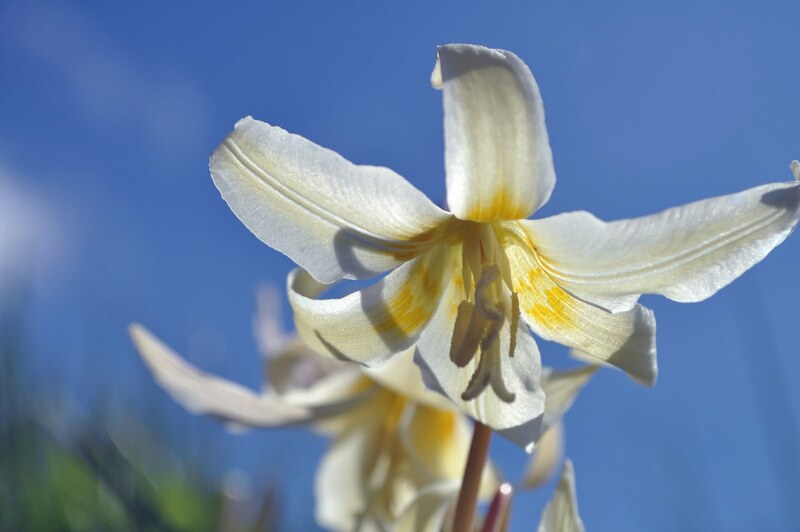 Late spring means the lupine and tiger lilies are still to come-- get there while you can! The road should be open the 7th, but the forest hike is well worth the extra 5 or 6 miles. The rest of the week held a different tenor. One of my sisters has been sick-- really scary sick with what now seems to be a particularly nasty virus but for a while seemed much worse, playing havoc with her blood cells and liver enzymes and keeping her down and fevered for nearly two weeks. Now this particular sister's level of General Life Enthusiasm and Energy makes me look like a snail on Valium by comparison (we call her "Barbi on Speed"); the fact she'd actually taken off work and laid down a few days completely freaked us out. By Monday, day 11 of her still feverish, I showed my ultimate codependent empathy by feeling peaked myself. It certainly wasn't contagion, since she lives a couple time zones away. By Tuesday, I was having a lot of trouble staying awake; by Wednesday cancelling clients and full on in bed with chills and fevers. I don't have my sister's stamina, but it's been years since I cancelled for being sick. But the body has its wisdom, and I had a virus that wanted its attention. Here's what happens when you get a foreign invader of the respiratory viral type. Itchy thoat and runny nose. Virus work by inserting themselves into cells where they first find a foothold, where they take over and multiply. Your white blood cells run to the rescue to route them out, clumping together and gumming things up; the irritation causes runny noses, sneezes and other symptoms that help expel the virus. Being no dummy, Virus uses these exits as a chance to find a new home in a fresher body. Fevers and Chills: I alternately burned or shook fiercely trying to warm up. Viruses prefer temperate climates, so when things heat up, it's bad news for the multiplying invaders. The body gets that, and does its part. General Malaise: When we're sick, we have a physiologic urge to take to our bed. Psychologically, that sure wasn't happening. But the body wants rest, and it doesn't care an iota what Mind wants at this point. I fought it the first couple of days, but by Wednesday the enormous feat of walking the garbage out left me swoony. I saw more of my pillow in three days than I had the previous two weeks. Time took on the quality of a weirdly diluted watercolor wash. And guilty as I felt calling in sick, I found out the world ran just fine without me. I don't know that this is a typical week. But I'd say it has shades of a typical life. The beautiful and the ugly (you should see my Kleenex piles), the rare and the tedious all thrown together. I got to practice giving help, and asking for it (thanks to my sweetheart, for blowing up the air mattress so I could nap in the sun this afternoon!). There was a whole lot of amazing I could've easily missed. Get well soon, dear sister; and congratulations and best wishes to summit sweethearts J and M.